The ACQ fans feature an acoustic foam of dual density sandwich construction specially selected for maximum sound absorption and quiet operation. The housing is designed to be as compact as possible for concealed false ceiling applications. Manufactured in Aluzinc sheet metal, with integral anchorage points to allow the fan to be suspended at any angle, via drop rods or anti vibration mounts, ensuring a quick and easy solution to installation of the in-line acoustic fans. The access panel is easily removed for inspection. The full range of Acoustic fans manufactured from Aluzinc and as such are suitable for both internal and external mounting as standard. Ten models are available in sizes 100, 125, 150, 160, 200, 250, 315, 400 and 500, providing air volumes from 0.075m3/s to 1.609m3/s (270m3/h to 5,792 m3/h) at free air. Designed for pressures up to 550 Pa.
At the heart of the range is a proven external rotor motor and backward curved impeller selected for low noise and high efficiency impeller assembly specially selected for its performance. The assembly is dynamically balanced to ISO 1940. Motors are rated to IP44 according to BS EN 60529. Ball bearings are greased for life and allow the fan to run at any angle. Insulation is Class ‘B’ (from -15˚C to +50˚C). 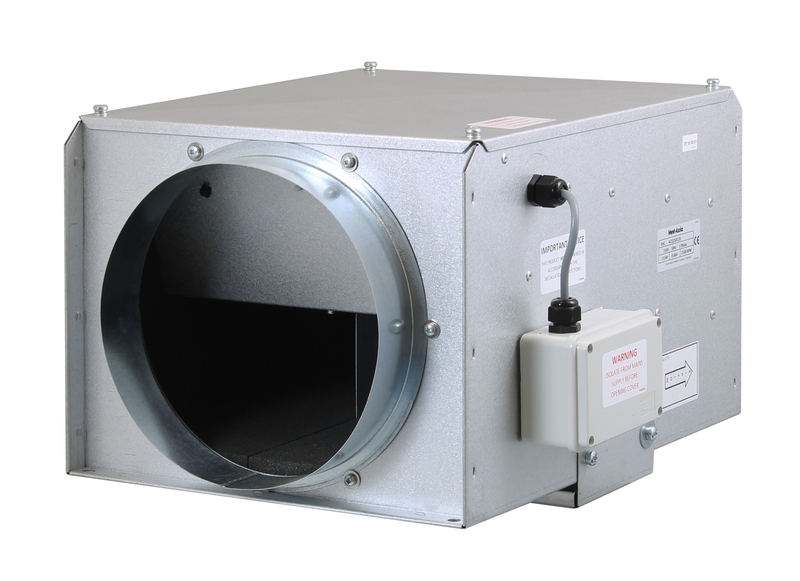 All Acoustic fans are suitable for speed control with either an Electronic or Auto Transformer. An Auto Transformer is recommended to ensure minimum noise levels during speed control so eliminating any possibility of motor harmonic noise. An IP54 Terminal Box is supplied with all models with 20mm cable gland entry. Tested to ISO5801. Published dB(A) figures are free field sound pressure levels at 3m with spherical propagation at a reference level of 2 x 10–5Pa (20 micro-Pascal). The inlet, outlet and breakout sound power level spectra figures are dB with a reference of 10–12 Watts (1 pico-watt). The ACQ range is supplied with motors wound to suit a 230V/1ph/50Hz supply capacitor start and run. Design and manufacture is in accordance with BS EN ISO 9001.